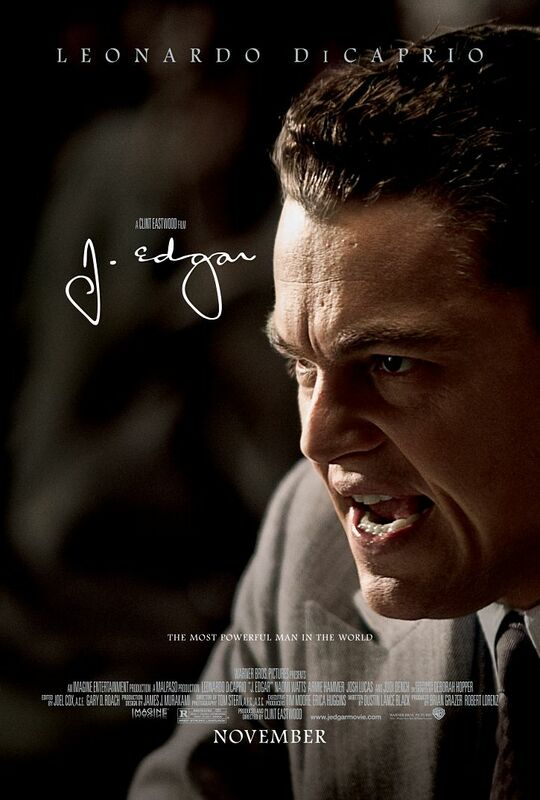 If "J. Edgar" were a research paper it would certainly get an "A". The new film from Clint Eastwood that stars Leonardo DiCaprio in the title role is deeply engrossing and incredibly detailed. The screenplay is penned by Dustin Lance Black, the man who's first script won him an Oscar (Milk), and is rich with important moments throughout history that shape the man who is our subject matter. The film is an engaging watch simply for the fact of the people involved with the project. DiCaprio is one of our finest actors and has given plenty of great performances that this one will indeed join. For his performance is not the issue with the film as a whole. If anything, his dedication and disappearance behind the prosthetic make-up help this film rise above the standard history essay that it is. The usually effective Eastwood seems to be lost in his own film here. It jumping so much from the 20's to the 30's and then to the 60's. It is difficult for us to know what point we are at some times and though this may have spawned from the script, it is the directors job to make clear his intentions, his themes that he wants the movie to emphasize, but instead of seeing those unfold in the storytelling we simply catch glimpses, hints of what this creative team is going for in DiCaprio's performance. It is actually strange how interested I was in the film, but at the same time so very bored with it. Maybe it was the anticipation that at any moment the film might pick up, that it might actually delve into what John Edgar did to in fact create the FBI, but instead we stay just above the surface. Skimming it and hitting the historically correct points while the motivation for what caused Edgar's entire mentality to develop as it did is scarcely shown. When the film does work up the courage to jump into speculative territory it quickly retreats as if hoping you didn't notice. This tactic works only for a short time before we realize the type of biopic this is and sadly, leaves us with a faint idea of what this film could have been had it really taken some chances. Hoover as he makes a public address. The first problem with a film like this is the its subject matter. The story of J. Edgar Hoover spans such a length of time and includes so many different aspects of a story that could be told it is difficult to even imagine where one would start (it probably would have worked better as a mini series a la John Adams). This gives way to the constant time hopping contained in the film, but it also detracts as the majority of the film can really be boiled down to two storylines. One being the case in which he tracked down the kidnapper of Charles Lindbergh's baby. The other being that of his lack of a personal life (he lives with his mother up until her death) and the possibility that Hoover might have been gay. He certainly tried with women; early in the film he takes out Helen Gandy a new colleague in the secretary pool at the time but decides to take her on a tour of the card catalog system he created for the Library of Congress rather than to dinner and a movie. Gandy seems to have been a vital role in Edgar's life, but is a relatively small role in the film that is played with great respect by Naomi Watts. Through the short moments we see her on screen we see the unwavering loyalty she has to the man while her expressions question his every move. 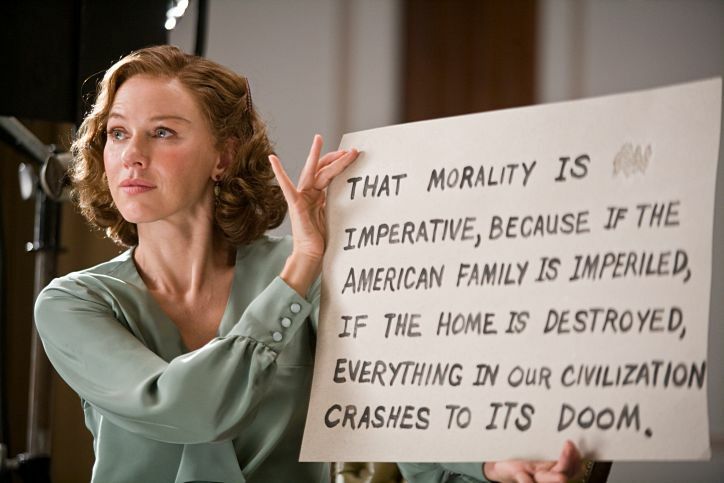 It is with a real vile feeling that we see Hoover's motivations begin to show. The film does a fine job of giving us the inspiration of his mother (Judi Dench) and how he comes to see himself. As someone deserving of high regard, of more importance to the world, as simply a better human being. It is with that kind of idea of one's self that gives him a craving for power. A power he will do anything to keep. He buries himself so deep in securing his position that he becomes a stunted human being. He stops growing, he never changes. 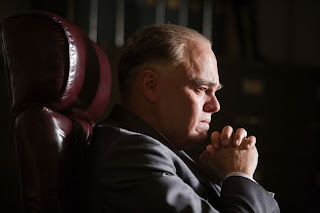 Even as his supposed enemies change from the communists in the 20's to the gangsters of the 30's and social rights activists of the 60's Hoover sees them all as threats to a way of life that is constantly changing in the world outside but for him has always been the same. He is afraid, even in death, to disappoint what his mother thought she raised and so creates a life-long goal of pushing what his heart yearns for to the back and instilling his legacy as the face of the FBI to the forefront. (Leonardo DiCaprio) attend a court hearing. What that heart yearned for we will never actually know. Hoover apparently had as many secrets himself as he kept filed away on others. 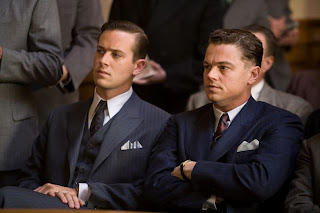 As said before, the one this film draws attention to is the speculation he was gay and had a relationship with Clyde Tolson, an associate director of the FBI who was Hoover's heir. When I say the film feels hesitant to jump into speculative territory this is what I mean. I would have been perfectly fine with a film that instead chronicled the actual process of what it took to create the centralized database devoted to the fingerprinting methods he instilled. I would have liked to have seen more the process of Hoover making the collection of forensic evidence a priority. Of how integrating experts from other fields into investigations would help solve crimes, and the film shows this happening to an extent, but it doesn't give us the back story on how it all came to be, on what Hoover had to go through to actually have these things happen. We hear dialogue about it, but the storytelling, the action of it is absent. Instead the film does decide to investigate his sexuality. This is done with a hesitant hand though as we only see DiCaprio's performance suggest this type of behavior when he is put into awkward situations with women or is in the presence of Mr. Tolson. This mysterious relationship, one that is never truly acted upon, is truly the tragedy of J. Edgar. Armie Hammer of "The Social Network" does a fine job of creating this role that is one thing to the public with implications of so much more. It is that combination of his mother and the need to retain his status that keeps Hoover's heart buried and in doing that to himself it has also created a film that feels very much the same. Cold and distant. Hoover thinks back on his life. There is ambition in this film and what it was meant to be yet the execution has produced a final product that while feeling full and grand also leaves you with a sense of emptiness as you leave the theater. Eastwood is a master filmmaker and his skills are certainly appreciated here. Bringing a cold gray palette to reflect the time period and the stone like shell our titular figure presents gives the movie a definitive mood. It is more the pacing that presents the issue with the aforementioned crosscutting between time periods that ends up proving to be a little too much while creating a lack of focus. It is as if the film jumps around so much that we never get to know Hoover that well, and for who he was at that point in his career. It doesn't help that when we fast forward to the 60's when he is attempting to keep the Kennedy's in line and do away with Martin Luther King that Leo is in old age make up that is hard to take him serious at times. Even worse is Hammer's make-up that creates a wax doll look for him as he lumbers around after a stroke. Needless to say the film has many missteps and ones that could have been corrected with a few more drafts of the script. The direction is certainly more than capable and DiCaprio is more than eager to deliver a performance that will win him a statue. He certainly does that here, but in the wrong film. As with the real J. Edgar Hoover, we may never know what this film really could have been but we can always speculate.